You might think stripes are a new-fangled thing. But it's the old rose heritage that brings the genetic striping to this spicy scented new-comer. 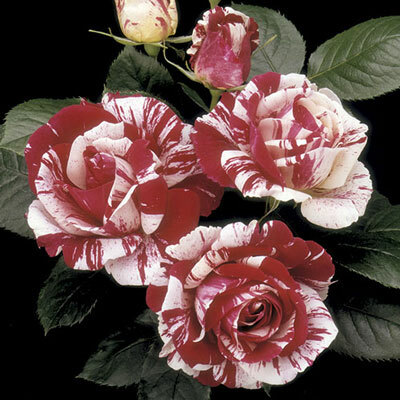 Each petal is as unique as a snowflake—some more burgundy-splashed-white, some more cream-swirled-red—all on the same vigorous plant. The old-fashioned form & fragrance may remind you of its stingy blooming ancestors. Yet the nearly continuous number of blossoms lets you know there's modern kinfolk in there, too. Distinctive clean quilted foliage. Best color & size in moderate temps. Perfect for potpourri.